The 12th International Symposium on Dendritic cells, October 7-11 2012, Daegu, South Korea. For my PhD project ‘The role of dendritic cells in the immunity against Giardia duodenalis in cattle’ I attended the International symposium on dendritic cells in Daegu, South Korea. The conference had a diverse programme, including all aspects of dendritic cells but emphasising their role in cancer, vaccines and immunotherapy. The first day of the conference, the presentations dealt with DC precursors, DC development and origin of different subsets. Ontogeny based systems were studied, leading to better understanding of each cell type and ability to explain different DC subsets with their different functions and phenotypes. The programme of the following days emphasized the role of DCs in blocking auto immune responses or to enhance the effectiveness of vaccines against infections or tumours. In order to elicit a productive immune response, the activation of DCs by a proper adjuvant is very important. This is why the following subjects were emphasized: TLR binding, pathogen recognition, antigen- processing and –presentation. On the last day of the conference, the topic was mucosal immunity. Since my PhD-project is on Giardia, a parasite of the small intestine, this was particularly interesting for me. In the intestine, DC are present in the lamina propria, mesenteric lymph nodes and in the Peyers Patches. Different intestinal DC subsets and their specific functions were discussed and also the interactions with the environment. In mice two major DC subsets are found in the intestinal lamina propria. The CD103+ subset, functioning as ‘classical DC’, are able to penetrate their dendrites trough the tight junctions of the intestinal epithelial monolayer and sample the intestinal lumen for antigens. This subset is known to cause T regulatory responses after migration to the mesenterial lymph nodes. Next to the CD103+ subset, the CX3CR1+ DC population is found in the lamina propria, this subset doesn’t migrate to the lymph nodes but is thought to modulate immune responses directly in the mucosa and serve as first line barrier against invading enteropathogens. Next to the diverse scientific presentations, the conference was a perfect opportunity to meet colleagues working in the same field. Certainly the poster sessions, more than 350 posters (! ), divided in sessions over 3 days, created the opportunity to learn and talk with other PhD students and Postdoc’s about protocols and research done in different laboratories both human and veterinary. Besides I was able to meet Bart Lambrecht from the Belgian VIB, he invited me to join the seminars that are regularly organised in his lab. I also had the opportunity discuss my work with Eduardo Villablanca, working on intestinal mucosal immunity in Harvard Med. School in Boston. To conclude, a great experience that updated my knowledge and insights in immunology. 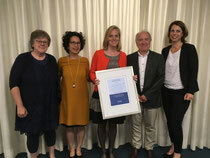 Internist-infectioloog Meta Roestenberg van het Leids Universitair Medisch Centrum (LUMC) ontvangt de Boehringer-Ingelheim prijs voor haar onderzoek in de translationele parasitologie. Roestenberg werkt aan experimentele klinische studies die moeten leiden tot een snellere en goedkopere ontwikkeling van nieuwe medicijnen en vaccins. More info. The 2018 Zoetis travel Grant was awarded to Irina Matetovici (Institute of Tropical Medicine Antwerp) to attend the The European Congress of Entomology (Naples,Italy), 2-6 July, 2018. Read about her experience here. Guy Caljon (University of Antwerp) received the Merial Award on 18 May 2017 in Utrecht for his work on insect-transmitted parasitic infections. More info. Eline Eberhardt (University of Antwerp) was awarded the Avia-GIS award for the best presentation at the Joint spring meeting of the Belgian Society of Parasitology & Protistology (BSPP) and the Netherlands Society of Parasitology (NVP) on 20th May 2016. Title of the presentation: Molecular detection of infection homogeneity and impact of miltefosine treatment in a Syrian Golden hamster model of Leishmania donovani and L. infantum visceral leishmaniasis. The 2017 Zoetis travel Grant was awarded to Franck Dumetz (Institute of Tropical Medicine Antwerp) to attend the WorldLeish6 conference, Toledo (Spain), May 16-20, 2017. Read about his experience here.